I'm still in the process of finding spots for some of my decor pieces. I don't have near as much space to display things as I did at the other house, so I'm thinking "rotation" might be the answer. My husband bought me this little table top "conservatory" several years ago, and it's always fun to change it out for the seasons. I had it on my hearth in the living room before, now it's taking it's turn on the little "entry hall" dresser that I use for a side table. It fits perfectly on the dresser, with room still for the lamp. and a small pot of faux African Violets. There's been some back and forth lately about real flowers versus faux or silk flowers. Do you mind hearing my thoughts on the subject? Gosh, who wouldn't want real flowers each and every week. All sweet smelling and fresh? sorry, not me. I love a gorgeous bouquet of cut flowers, roses, hydrangeas, peonies, etc. I LOVE fresh flowers, but they make my allergies unbearable. I get a sore throat and runny nose and itchy eyes after I've had them for an hour or two. PLUS, I have cats who think they are the salad bar from some heavenly restaurant. They chew on the stems, eat the flowers, knock the vase over trying to get a drink of the water, and then proceed to barf up the deliciousness all over creation. So...no...I use mostly faux. This is not the day of Grannie's Wal Mart plastic flowers. Get over it Oprah and Nate Berkus. Some of us have the sense to put together a beautiful bouquet that looks real. The key is to not have them all over the house. (which I may or may not be guilty of in the past) I'm trying to go more simple here and less cluttered. But I still love me some flower arrangements. so you can see a little easier. 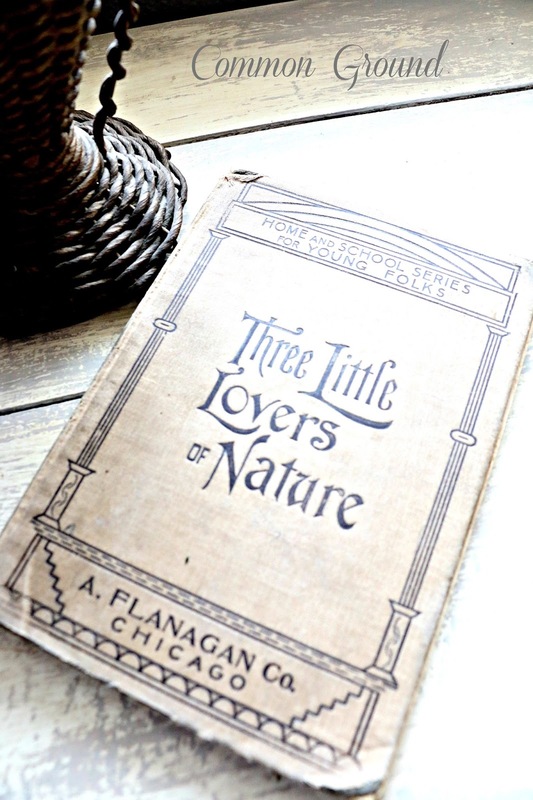 "The Three Little Lovers of Nature". Mine was published in 1895. 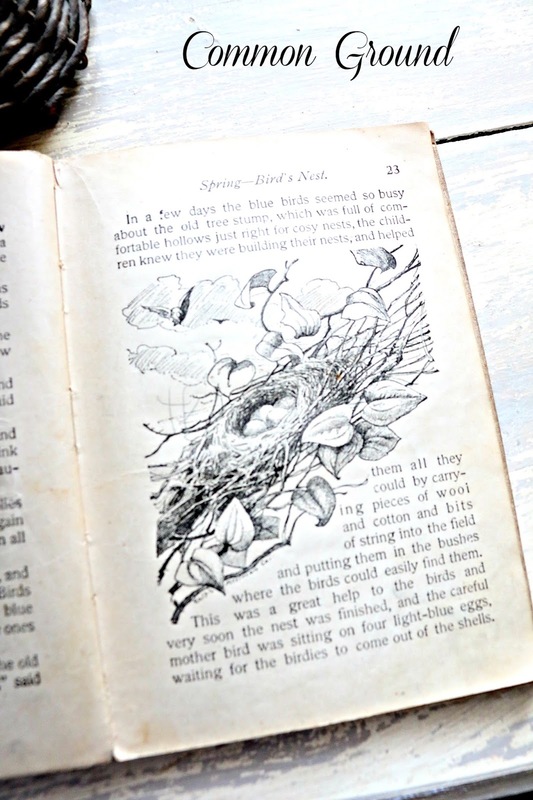 It has some precious illustrations of Nature. Feel free to express your honest opinion of Real versus Faux Silk. Hurray, it's cold, but the sun is shining! 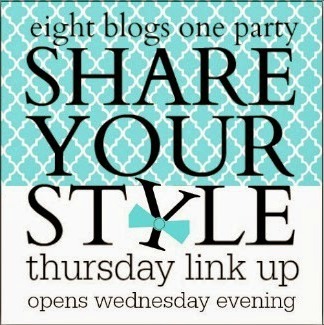 See you tomorrow evening at 6 PM Central for Share Your Style! Oh the sun and the birds...it reminds me of spring. 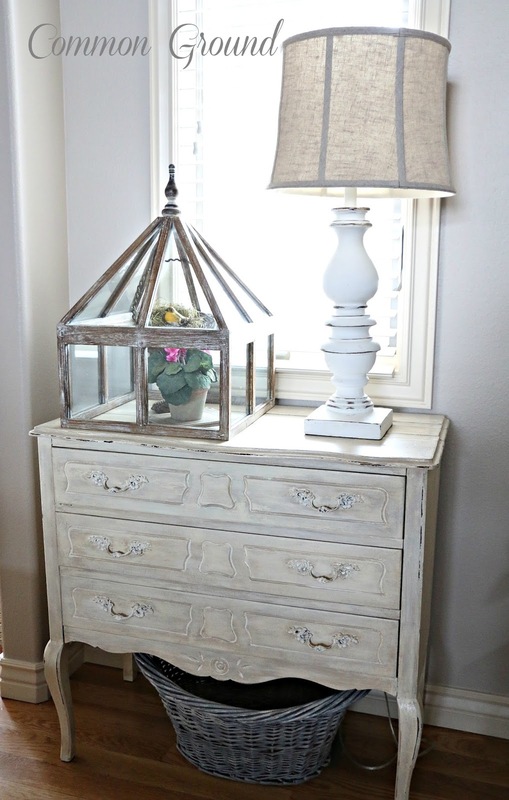 How gorgeous is that little dresser??? I love the real, but the cost to have real all the time is prohibitive. If I see some faux that looks good, I grab it up! Just bought a faux fern - never thought I'd say that, but it looks good and I can't kill it!!! Your vignette looks good, and the violet even looks real. I'm certainly not faux flowers in small doses, and I've found a few that I like for a simple, single look. I had lunch with a good friend last week, and she said her MIL has an entire attic filled with faux flower arrangements - on the floor space, all along the framing, in between floor boards where it's just insulation (and yep, she fell through, into the garage ceiling, trying to retrieve one of her arrangements, and she's not an agile, young chick, she's over 80). I told my friend she wouldn't have to worry about funeral home arrangements - her MIL is taking care of her own death wish and florals, lol. oh my gosh, I'm laughing so hard...hope that's not too mean! you gave a great visual here! I love that piece Debra and the simply display inside of it! 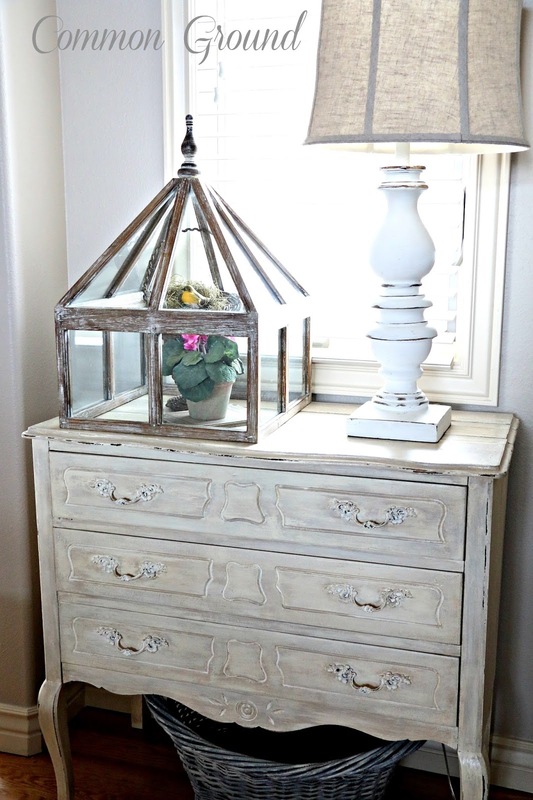 Love that pretty dresser too! Well you could have fooled me! I like how you used bigger accessories on the chest. Simple but it makes a big statement. LOVE the conservatory vignette, dear friend!!! Like you, allergies keep me from enjoying the "real deal" with florals! I manage about two to three 'green' houseplants alive here on the drought ridden Prairie! I often rotate decor accessories from the lower to the upper level and vice versus. 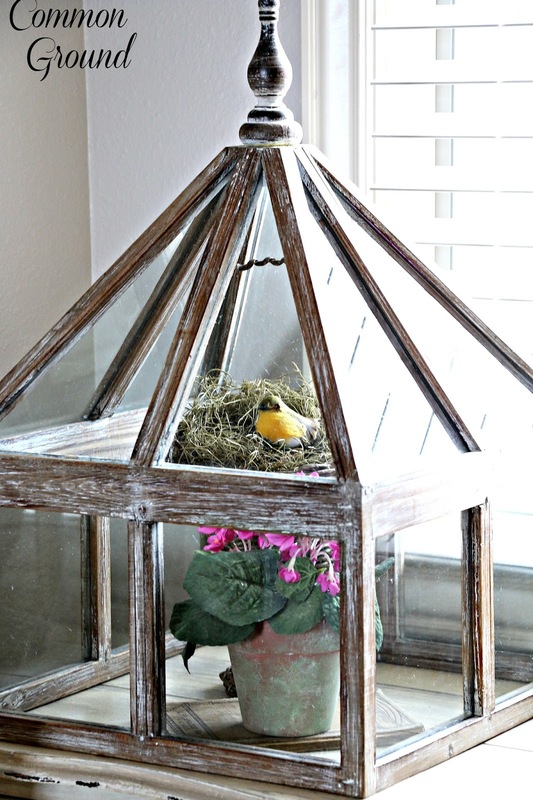 Thank you for sharing how you've worked some of the olden favorites into your new home!!! I love your little conservatory Debra!... 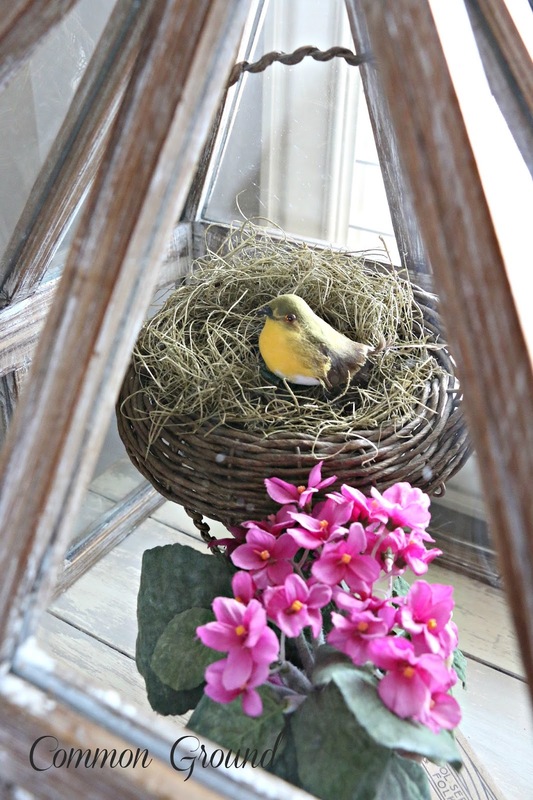 and I love love love your faux african violets with the little birdie nest... as for faux vs real... I am like you, my allergies go CRAZY with real flowers in the house!... I love to smell them in my garden, but every time I bring them inside, without fail, I get so stuffed up I cannot even breathe!... I do put my dried rose petals here and there, but always in a container or glass jar of some kind to keep the smell from getting to me... and nowadays, the silk flowers out there are just gorgeous!... I save all of mine through the seasons, and use them over and over again... I do have some llive green houseplants, up away from Tessy!... I also love alot of the silk ivy and such... and I love it when I get a Michaels coupon and find pretty silk roses and such... sooo... I could care less what "Oprah" thinks!... never watched her even once!... 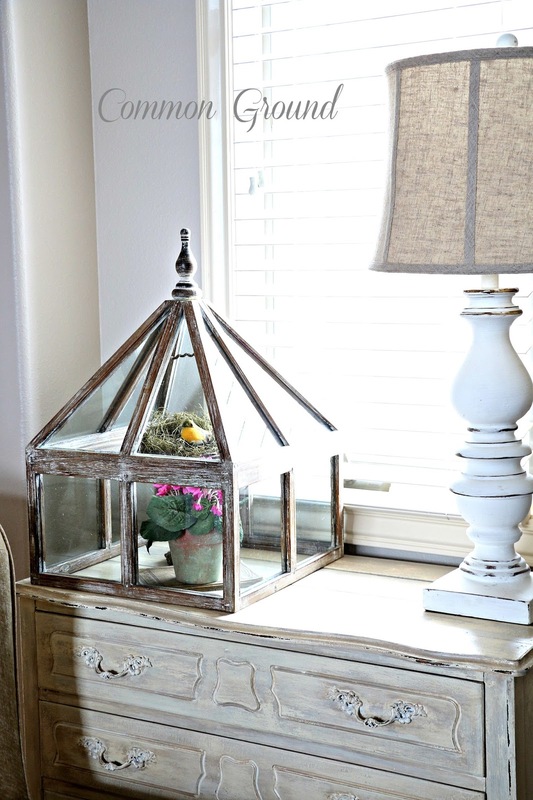 I am probably the only woman alive who has never watched her show, but I just never did... now I want a little conservatory like yours, I absolutely love it!... xoxo... Julie Marie PS I love faux birdnests too!!!!! I agree Debra...faux is fine if you don't over do it. The conservatory is beautiful!!! Looks perfect to me! I never would have known your plant wasn't real. 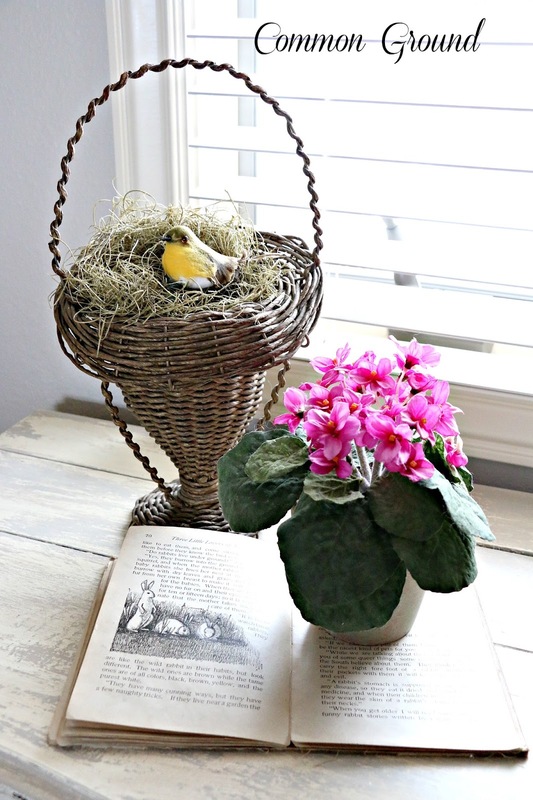 Love your Springy looking vignette, Debra! Such a great piece that conservatory is, too. I am all for faux, especially since my indoor plant thumb has turned from green to black. The greenery I have inside now (mostly ferns or ivies) is faux because the real ones I would buy would die. I am stubborn enough to continue trying though! Outside everything does just fine and really thrives. The dresser is so pretty Debra and the spring vignette is so cute on there. I love faux flowers and have them all over my home. They are so real like now and they last forever so why not have them. Oprah and Nat Berkus can afford to change out fresh flowers all the time not a luxury for the majority of us so I agree faux are pretty too. I agree, fresh flowers ALL the time are not affordable around here!! Love them and bring them in when blooming in my garden and once in a while buy some at the grocer's. I also love the faux and have them in my home, being a retired floral designer, I can't resist them and love arranging them for myself and friends. I have green plants growing in the sunroom, but I use faux as well. I agree with you, I could care less what Oprah and Nate have to say. Love the display on the dresser! It looks lovely! We are deep into moving mode. 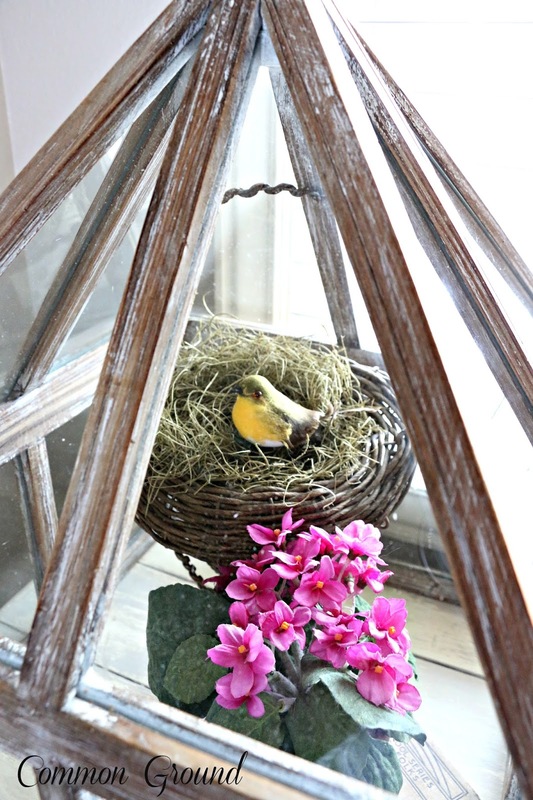 I can't wait to do Spring vignettes at our new home. Yours is gorgeous, as usual. Hi - It all looks very lovely. I think you and I have a cat from the same litter. Why do they love to eat something that they cannot digest. You just have to love them...Betty from, freezing cold Ontario,Canada. I enjoy my blooms out in the yard and hate to cut them. I use some faux because most real do aggravate my allergies. Evey two weeks I buy a few carnations to put in a small vase by the kitchen sink. When they are dried, I stick them in a decorative jar. Love your vignette and drooling over the book! What lovely features with the bird nests. Thank you so much for the great and NEW party! Hugs to all the sweet hostesses and specially you Debra. ...and see you tomorrow too. Hey, we do what we have to do. Not everybody has that kind of money so we can be flower snobs. Whatever floats our boats. I have some really delicate viney flowers, love them, they look pretty and as real as any so I use them. It's so dusty where we live everything is dusty all the time anyway so I don't worry about it. Just take them to shower once to get dust out and let them dry in garden tub. They add right soft touch. Sometimes in Summer I put some of them on our metal head board, they help room look pretty and floaty, summery. I got rid of some really pretty big bushy hydrangeas, faux of course and wish I hadn't, would be pretty in arrangements in boxes, trugs, what ever vessel I can find at time. 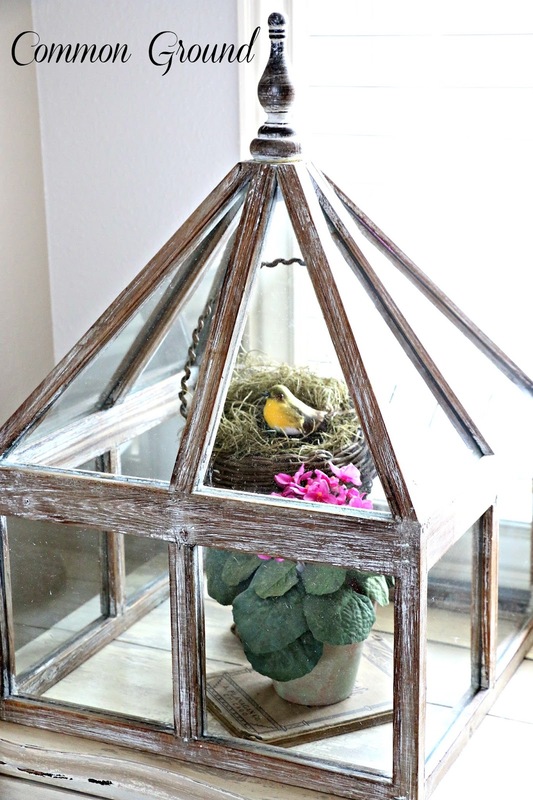 I Like to change things around, have several wire bird cages from Hobby Lobby and Michaels have gotten on good sales and they work great for arrangements in all seasons. I use wire bird cage on edge of tub for my pretty looking/smelling soaps, adds a nice touch in bathroom. Love to walk in to smell the soaps. Luckily we have a window in our bathroom that helps carry the fragrance to our bedroom when windows open. We don't have money for alot so I try to use imagination to put things out to help snazzy up our home. Many of my props have had for many years and they're still current. So enjoy fixing up our home, enjoy the challenge of using what I have and can make with what I have. We have a single wide mfg. home 16x80 so try to change things around, make pillow covers, table runners, curtains whatever I can think of, so happy to have so much inspiration on blog land, sure keeps me busy. This is fabulous, I featured you this morning on my Facebook page and pinned as well. But that book is A-mazing! 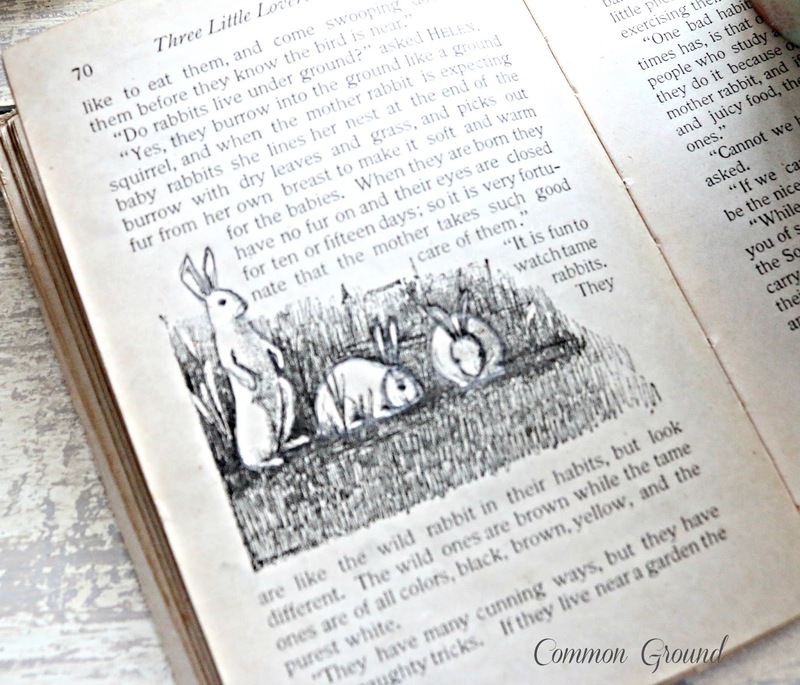 I am a sucker for old books and beautiful pen and ink illustrations! Thanks for linking up at this week's Shabbilicious Link party! Debra, it's a darling vignette under your conservatory! That book was a wonderful find. Love the illustrations! I have one that looks almost identical and have corralled a few chicks under mine this year. I too love fresh flowers, but they make some gorgeous faux ones now days and I have a few that I think are so pretty. Your Violets really look real! Thanks for sharing with SYC. 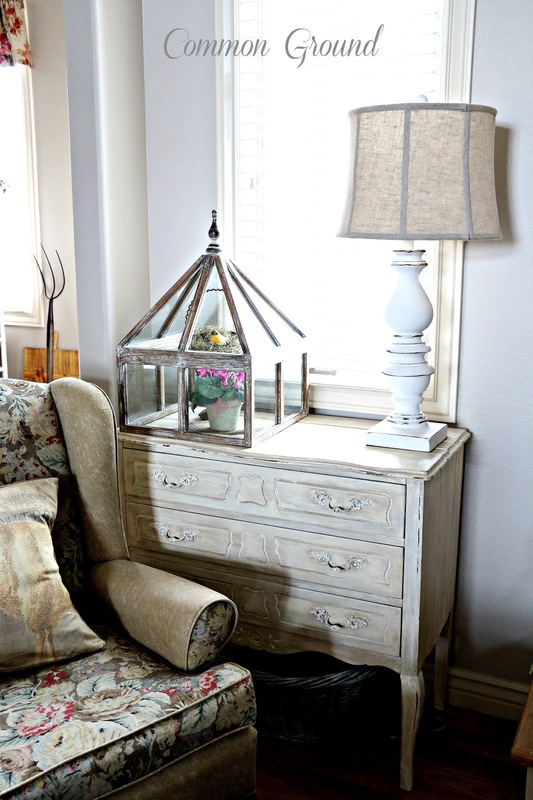 Oh I love this vignette - the dresser - with the chair is perfection in that spot but that terrarium is absolutely gorgeous - I'd love to have one of those !!! 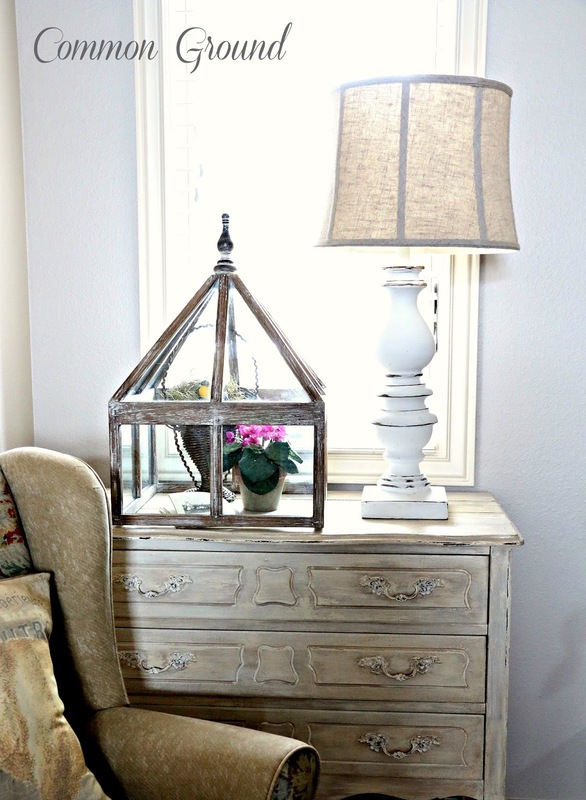 Love this vignette! I have a similar shaped conservatory piece except it came with no glass- it's definitely not a true conservatory! I am a big fan of faux plants for various reasons. It's practical they never look half dead and you don't have to re-invest! I used to grow a lot of indoor plants but after a few accidents with the plants staining carpet or wood I gave up. Of course who doesn't love real flowers- can't beat them but today's silk one's often look so real you have to get up close to be sure! Anyway your little violets look real as could be and the book is adorable.